Put simply, waste management is the collection, transportation and disposal of waste products including rubbish and sewage. Over recent years the government has realised disposal of waste is an environmental issue that needs to be tackled before it gets out of hand. For this reason several waste management initiatives have been introduced for commercial and residential concerns. Restrictions on the amount of waste households put out for their kerbside collection and incentives for recycling are just a couple of avenues that effect all the UK. Waste management concerns the use of our rubbish as a valuable resource rather than just throwing things in a landfill and covering it all over. Many new companies have sprung up in the wake of new waste regulations and one of those is 24/7 Waste Removal, located in London. 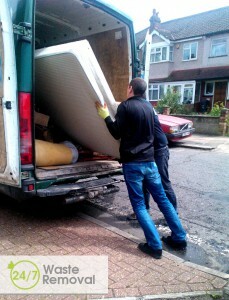 They offer an effective and efficient waste removal service for home owners and commercial enterprises alike. They have teams of excellently trained and knowledgeable experts who understand the need for a reliable and safe waste collection service. And they’re not new to the business as they’ve been operating throughout London for more than 10 years. Landfill sites are located across the country but they are reaching maximum capacity, which is one of the reasons we’re all being encouraged to reduce, reuse and recycle as part of our normal routine. Basically a landfill site is a big hole in the ground that is filled with rubbish and then covered over. The problem with this kind of waste disposal is that chemicals and harmful substances leak into the surrounding soil, causing harm to the environment for many years to come. This is why all households and businesses are now restricted in the items they can place in their wheelie bins. This waste management technique involves burning solid waste at extremely high temperatures. The volume of the waste is reduced by as much as 30% so it doesn’t take up as much space when placed in the landfill. It can also be converted into heat, gas and steam. In places like Japan, where there are no landfill sites, this is a very popular method of disposing of solid waste. Recovery is the process of taking discarded items and converting them into energy in the form of fuel, electricity or heat. Recycling involves turning waste products into new products to save on energy consumption and raw materials. The ethos behind recycling is to reduce energy consumption, the size of landfills, air and water pollution and greenhouse gases and save our natural resources. Popular in the US, this method converts organic matter into a synthetic gas using a plasma torch. It is extremely effective but still in its early stages. There is virtually no waste product at the end just a useful fuel and slag that can be used as a construction material. This process takes plant remains, garden and kitchen waste and turns it into a nutrient rich material. The organic material is left to sit in one place for several months allowing microbes to digest the organic waste and turn it into safe compost. Many areas of the country now operate a food waste collection service as part of their weekly recycling operation. But you can also participate in the process by having your own compost pile at the bottom of the garden. This involves converting waste that can’t be recycled into heat, electricity or fuel using a variety of different processes, giving us a renewable energy source. It also reduces carbon emissions. This waste management process is something we can all participate in. We all need to do our bit in reducing the amount of waste we create. If we don’t all make the effort pretty soon we’ll have nowhere to put all the trash and junk we make and our natural resources will have dwindled to a critical level. 24/7 Waste Removal encourages you to do your bit for the environment and resources by recycling wherever possible and reducing your overall consumption and waste. If we all work together the world will be a much better place. This entry was posted in "The More You Know" on Friday, October 10th, 2014 by 24/7 Waste Removal.